So, summarizing many of my last posts, the artists depict what the psychologists’ research indicate: follow the Journey to satisfy the four needs of food, warmth, shelter, nurture, safety, belongingness, and self-esteem. This Journey is needed to reach the “good life” with the potential for traveling the Adventure. The great philosophers teach the same thing: Epicurus speaks of reducing pain and anxiety (through the flow experiences of the psychologists) to enjoy a life apart from the vagaries of an everyday existence. The Stoics speak of attaining the virtues (achieved during the flow experiences of the psychologists) necessary for achieving happiness. Aristotle speaks of the need for a caring family and a just society in order to secure one’s place in life as well as the wealth to live a life free of fear and anxiety leading to the recognition and appreciation of others. But Aristotle goes further to add that happiness includes leading a virtuous life. It is St. Aquinas that goes one step further. He agrees with Aristotle, who himself incorporates the philosophies of Epicurus and the Stoics, and supports the psychological theories of the satisfaction of needs and the desire for flow experiences. But St. Aquinas notes that these other philosophical and psychological theories only take the individual up to the threshold of happiness and without any benefit to society. They do take the individual through the Journey and the Adventure, but leave the individual short of happiness. And, they leave society without any benefit of the efforts of the individual that has completed the Adventure. St. Aquinas realized the one element missing from the other theories – the one element that the great artists have always realized. This one element is love of neighbor! It is the love of one’s family or community that pulls the Adventurer across the threshold into happiness. Without this love for the efforts of the Adventurer, happiness will not be achieved. In addition, the great gifts of the Adventure will not be delivered to the family or community – all the effort will have been wasted. The individual will remain lost in the Adventure and his/her great gift to family/society will be lost forever. So, what have we learned. 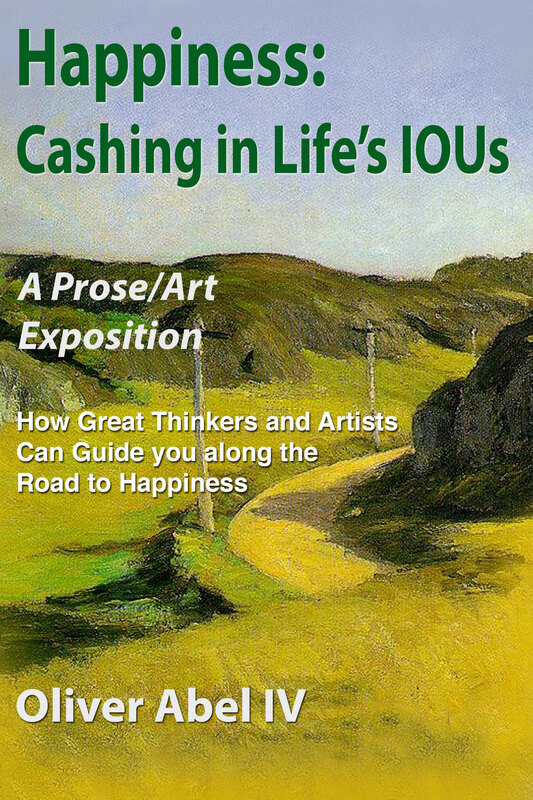 Everyone that we have discussed, and the great thinkers and artists mentioned in my book, are correct regarding some portion of the road to happiness. Some emphasize the Journey and others emphasize the Adventure. Aristotle is very close, as is Maslow. But one person capture it all – St. Aquinas. He agreed with Aristotle, but went one step further to mention that the love of neighbor is critical. It is this love that is the final piece of the happiness puzzle. The artists have know it all along. But it is nice to have it all confirmed and nicely packaged by a philosopher. So, the psychologists with their science, and the artists with their insights, all converge on the philosophers and their thinkings, and in particular, St. Aquinas. Not bad for a man who lived nearly 1000 years ago. This entry was posted in Key Ancient Philosophers and tagged Aristotle, st. aquinas on July 31, 2015 by oliver. Continuing from my previous post, there is one other work of art that I would like to discuss that vividly demonstrates the need for love of neighbor to cross the threshold to happiness. 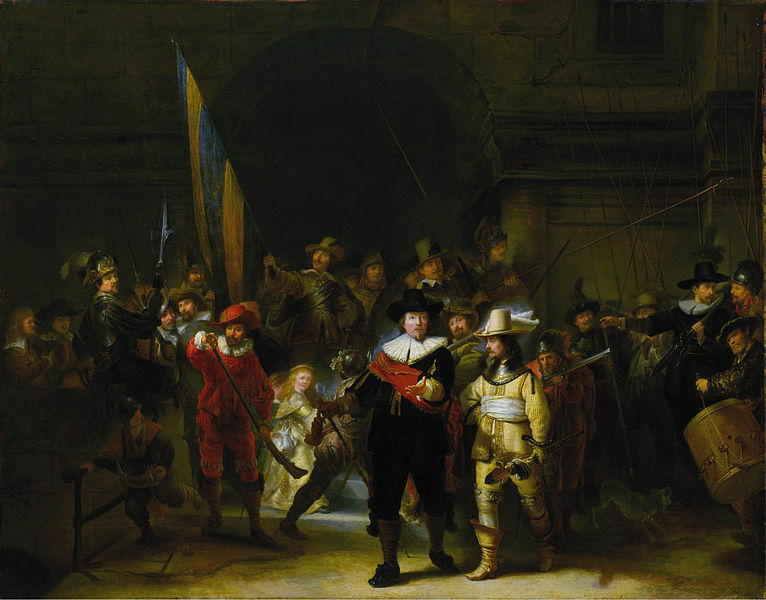 This second work of art is the masterpiece, The Night Watch, by Rembrandt. In this painting we see the the two main characters as leaders of a band of men dedicated to protecting their community. The leaders are wealthy, respected, and honored for their duty. However, they also exhibit wisdom and courage, are not tempted by money, power, or fame, and are dedicated to providing security to the community under their watch. Perhaps the most detail of the painting is the little girl in the background. She is illuminated in expressing her thanks for the safety provided by the band of men. She is the depiction of the love of neighbor or the appreciation for the calling of the leaders and their men. She brings to life the happiness of the others in the painting. Without this little girl, the painting would be an incomplete representation of happiness. While all the other needs as expressed by Aristotle and Maslow are present in the picture, it is the little girl that pulls the men across the threshold and into happiness. The men have no further needs or desires. Their calling is complete; happiness is achieved and society flourishes through the safety they prove their community. The two leaders in the center, bathed in light, represent the heroes returning from the trials of the Adventure. They are separate from the others, but able to move between the world of community guardians and their everyday existence. They display a successful past, autonomy, concern for the welfare of their community (represented by the illuminated little girl expressing appreciation and thanks), a rich appreciation for life, strong interpersonal relationships, and self-sufficiency. Like the Rockwell painting, this painting presents not only individual happiness fully-realized, but the flourishing of one’s community (or family). What a great representation of a great outcome! This entry was posted in Key Ancient Philosophers and tagged Aristotle, Rembrandt, st. aquinas on July 24, 2015 by oliver. Continuing from my previous post, if St. Aquinas (whose philosophy regarding happiness in this life is an extension of that of Aristotle) is correct regarding the importance of love of neighbor in crossing the threshold to happiness, then what works of art might express this aspect of his philosophy? By the way, the theoretical research of Maslow, backed by recent empirical research verifying his theories regarding the hierarchy of needs, is similar to the philosophy of Aristotle, but presented in psychological terminology. I would like to discuss two works of art that clearly represent the importance of the love of neighbor for fully-virtuous individuals to reach happiness (or, in psychological terms, for self-actualized individuals to reach happiness). 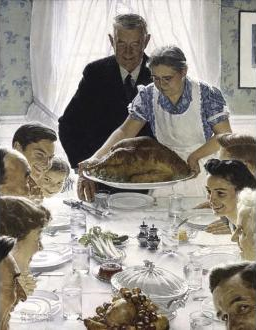 The first work of art is Freedom from Want, by Rockwell. In this work the two grandparents express happiness – happiness brought about by the love of their children and grandchildren. The grandparents express belongingness, self-esteem, honor, wisdom, courage, temperance (see Puritanical table setting) and justice. They heeded the call, took the Adventure, and returned back to the everyday world with assistance of the love of their family. In return they bestow nurturing care and love for their children and grandchildren. Attention is on the isolated grandparents, who as a couple, accepted the call to adventure and sacrificed through hard work and dedication for the successful upbringing of their family. The boon that they captured was not just tending to their family’s needs, but serving as a role model for others who might be considering a similar call to adventure. The grandparents have achieved happiness as exhibited by a sense of freedom, lack of needs or desires, and a sense of virtuous activity (possession of goods necessary for proper living but with modesty (see table setting), concern for family, and the loved displayed by the family members. This entry was posted in Key Ancient Philosophers and tagged Aristotle, rockwell, st. aquinas on July 17, 2015 by oliver. Continuing from my last post, so Aristotle’s teachings are right for most of the road to happiness. In fact, he is correct for the Journey (first four Maslow needs) and the Adventure (final Maslow need of Self-actualization). But both Maslow and Aristotle have one shortcoming – crossing the threshold into happiness. Aristotle’s virtues take us to self-actualization: let us call that the threshold of happiness. This is the point in which the fully-virtuous individual has realized his/her calling and is complete with no further human needs or desires, except one. This one final need, outside of the abilities of the individual to satisfy, is the love or appreciation of others for all the effort of the Adventure to complete one’s calling. St. Aquinas, the final philosopher, recognizes this need for love. This is love by society for the individual at the threshold of happiness. This individual not only needs this love to gain happiness, but society needs this love to benefit from the boon that has been captured by the individual. St. Aquinas agrees with Aristotle that the road to happiness requires family nurturing, a just society, friends, wealth, and honor, as well as the four cardinal virtues of wisdom, courage, temperance, and justice. But St. Aquinas goes one step further in teaching that the road to happiness in this life, while not as fulfilling as happiness in the next life, requires the Aristotelian way of life peppered with the love of neighbor. It is this love that pulls the fully-virtuous individual across the threshold to happiness while delivering the boon of his/her calling to society. It is this simultaneous achievement of happiness by the individual and the flourishing of society that St. Aquinas presents in his teachings. This is the ultimate philosophy, supported by psychological research, that not only encourages the happiness of the individual but also the flourishing of society. This entry was posted in Key Ancient Philosophers and tagged Aquinas, Aristotle, st. aquinas on July 10, 2015 by oliver. I have spent the last six posts talking about the Christian approach to the road to happiness; in particular, St. Aquinas’ “twofold happiness.” The first happiness, the one in this life, requires (among other elements) the philosophical virtues of wisdom courage, moderation, and justice. The second happiness, the one in the next life, requires the theological virtues of Faith, Hope, and Charity. The Bible, and especially the Christian faith, teach that the above three theological virtues are necessary for eternal happiness or beatitudo. As such, one of the main obligations of religious institutions in the West is guidance in how best to lead a life in which these virtues may be attained by the faithful. This guidance includes religious attendance, the sacraments, offerings, community service, etc. A major tenet of the Christian faith is a life open to the theological virtues will be more likely to attain and exercise the cardinal virtues, thus moving the faithful forward towards happiness in this life. In addition, this happiness is but a precursor, a building block, to the eternal happiness or beatitudo in the next life. Final thoughts in my next post! This entry was posted in Uncategorized and tagged happiness in next life, st. aquinas, twofold happiness on September 29, 2014 by oliver. Let’s now discuss the third and final theological virtue needed for happiness in the next life: Charity. Charity is the final theological virtue in which we love God, and our neighbor as ourself. Charity is the first of the theological virtues and superior to all other virtues. Charity could be considered the force pulling the adventurer across the threshold to eternal happiness. The force is the love of God for the adventurer. It is the theological extension of love of neighbor needed by the hero to cross the threshold back to the everyday world and the attainment of happiness. In Christianity, Jesus, the companion of the return, is the theological virtue of Charity. More in my next post! This entry was posted in Uncategorized and tagged charity, happiness in next life, st. aquinas, twofold happiness on September 26, 2014 by oliver. Unlike Faith, hope is a longing for beatitudo (happiness in the next life). Hope is the desire for the difficult but attainable good of eternal happiness. Hope could be considered the nourishment for the adventure, shielding us from discouragement. It is the theological extension of the two virtues of moderation and justice needed to fight the trials, to capture of the boon, and to desire the return to the everyday world. It is the yearning to have our own adventurers in this life be accepted by God in the next life. Hope could be the corollary to the two (philosophical) virtues of moderation and justice needed during the Adventure. Campbell makes mention of a second time when the hero relies on “supernatural aid,” in the “meeting with the goddess” occurring during the Adventure. She is “the paragon of beauty, the reply to all desire, the bliss-bestowing goal of every earthly and unearthly quest. … For she is the incarnation of the promise of perfection …” She represents the theological virtue of Hope. Up next, the virtue of Charity! This entry was posted in Uncategorized and tagged happiness in next life, hope, st. aquinas, twofold happiness on September 22, 2014 by oliver.